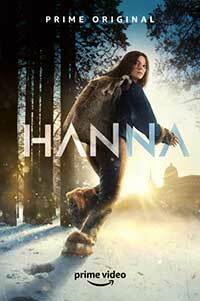 Show creator David Farr has reworked his 2011 feature-length film Hanna into an eight-episode Amazon Prime series bearing the same title. A flashback shows Erik Heller (Joel Kinnaman) and Johanna Petrescu (Joanna Kulig) abducting a baby who becomes the title character. Their getaway is costly as Johanna dies in an attack coordinated by European CIA Deputy Director Marissa Wiegler (Mireille Enos). Marissa had previously worked with Erik on a classified project to recruit pregnant women to a remote Romanian factory where genetically-engineered children like Hanna were born. Fifteen years later, Erik and Hanna (Esme Creed-Miles) are living in a remote log cabin in the Polish forest where she is being trained to become a stone-cold killer. Hanna begins to realize that there is another world out there but before she can explore it, special ops forces take her to a covert Moroccan facility from which she soon escapes. In the Moroccan desert, Hanna meets a young English girl, Sophie (Rhianne Barreto), who has wandered away from her family and he two girls make it back to her van. Hanna leverages her newfound friendship into a free pass to Berlin where she reunites with Erik. Soon, Hanna, Erik, and his former military comrades Rudi (Stefan Rudolf) Lukas (Peter Ferdinando) and Elsa (Katharina Heyer) stage a daring nighttime raid on the Potsdam Armory, a stunt that rapidly gets them on to the radar of Marissa and her aide Michael Jacobs (Andy Nyman). An attempt to nab Heller goes awry, and Marissa ends up as his hostage. Erik threatens harm to her new Parisian family, lover Olivier (Felicien Juttner) and his young son Benoit (Giles Norris-Tari), unless he is allowed to escape with Hanna. To show that he is serious, Erik kills Jacobs and sets the remaining wheels of the plot in motion. Utrax is revealed as the research company that changed Hanna’s destiny when it altered her DNA sequences as it has done to the numerous young women now living in the heavily-guarded Romanian compound. Ultrax chief agent Jerome Sawyer (Khalid Abdala) frees Marissa but Erik has already hit the road one last time with Hanna and intends to reunite her with biological father before he bids her a final farewell. There are still unexpected twists lying ahead for both of them as the series ends with some important plot elements remaining unresolved. David Farr has tried his best to retool his original script, and, this 2019 version requires more viewer patience since it tells mostly the same story but in far greater detail. Where the new version differs the most from its predecessor is in the considerable attention paid to Hanna’s surrogate English family, Erik’s wartime comrades, and the experimental facility. Both Hannas are portrayed by age-appropriate actors. Some viewers will prefer the wide-eyed innocence of Saoirse Ronan while others might opt for the greater physicality of Esme Creed-Miles. Preferences for Cate Blanchette over Mireille Enos or Eric Bana over Joel Kinnaman will also be matters of personal taste rather than of quality of their performances. In spite of her faux Southern accent, Blanchette is much more vicious than Enos who appears to have a genuine soft spot for the young girl. Conversely, Kinnaman is the more brutal Erik Heller. Each filmed treatment of Hanna is effective on its dramatic and visual grounds and this new one is definitely worth watching. Highly recommended. This coming of age thriller follows the story of a girl with special abilities raised off the grid in the forest by her father as she evades the relentless pursuit of a CIA operative running a dark ops government program. A well-adapted version of the well-regarded film transformed into an 8-episode series that adds depth to its characters and storyline.